The Main Menu screen will be the first thing you see when you log in to Artisan and holds a lot of information, which we will talk about here. We will begin by breaking the screen displayed into sections and what can be accomplished in these sections. 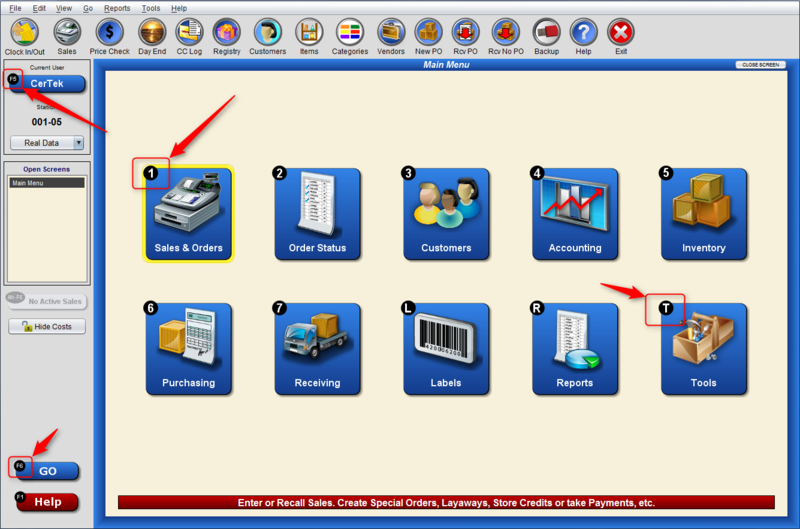 Highlighted and directed to in red is the Toolbar that gives you quick access to the functions in Artisan POS. There highlighted buttons are Tool Bar Buttons. These are configurable buttons designed for you to have some quickly accessible features usually reserved for the Toolbar menu. You can use View – Tool Bar Buttons… – to configure these to display just the buttons that you would like, or to remove all of the buttons. If you would like the default view, then you can also Restore Defaults. This section allows you to view the currently logged in User, as well as quickly log in and out by clicking on the blue icon. The Station name will be displayed in this section. You’ll also find a drop-down button that will allow Users to toggle between Real Data and Practice (Sample Data.) Sample Data is a great way to try out new tasks and processes without causing any interruptions or issues with the actual data stored on Artisan. Open Screens will provide a list of the screens that you have open and allow you to switch between them efficiently for better multitasking. You’ll notice that the name of the screen that you’re currently on displays in Open Screens, and that will be the way it displays multiple screens. You can also close open screens by “right clicking” with the mouse on the Open Screens box which will display the choice of Close Screen and Close All Screen. CerTek encourages use of multiple screens but would also like to warn against maintaining too many open screens at one period of time due to resource management. These buttons will give you quick access to various integral parts of running your business. Unlike Tool Bar Buttons, the buttons located in this section can not be modified or changed. Clicking on one of the buttons in the center of the page will take you directly to the menu or task associated with it. Highlighted in this image is the visible shortcut indication. If the shortcut indicator shows a number key or “F5” for example, then you can hit those directly without needing to apply any other buttons to go directly to the directed menu or function. For example, pressing the “T” key on your keyboard will take you into the Tools menu.